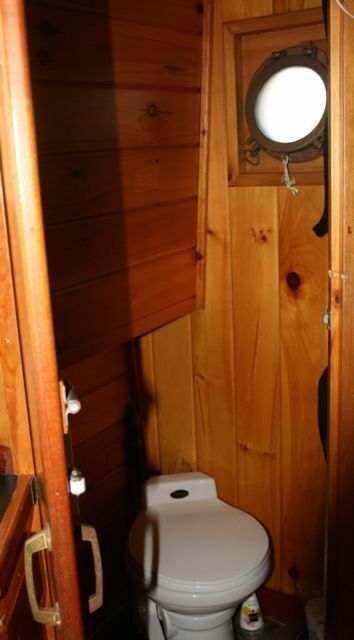 Our boat bathroom fixtures are slightly more glamorous than a military latrine. You might even call them "European-style" because, instead of the toilet, sink and shower being collected in a single generous room, American McMansion style, each fixture has its own compartment. Let's start at the top, or "head" in nautical speak. Our vessel actually has TWO heads (yes, two heads are better than one). Marine toilets are notorious for failing, and if your head dies on a long cruise, it's handy to have a backup. 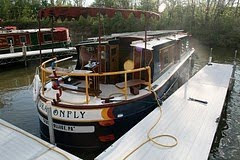 Dragonfly has two "staterooms" (bedrooms) on the boat, and each room has its own head, hidden in a small pine-paneled compartment that visitors always mistake for the closet. Marine heads are a bit different from port-a-potties. They flush to a holding tank, but they use a small amount of water to flush, and there's no blue chemical sludge. I know what you are wondering: 1) Does it smell? and 2) What do you do when the holding tanks are full? The answers are 1) no (you put an enzyme-laced deodorant in the tank that works pretty well) and 2) you go to a marina with "pump-out" facilities. If you REALLY want to know exactly how a pump-out works, by all means let me know! Dragonfly also has a shower . . . also hidden inside a pine-panelled compartment. For the Cap'n, who is 6'3", it's close quarters. But it's better than having NO shower. When we are NOT showering, we store my folding bicycle in this otherwise empty space, which leads to more startled reactions from visitors who, again, open the door expecting to find a closet. (Most recent question: "Why do you have a wheelchair?" You may be wondering, is that a hot shower or a cold shower? Blissfully, hot . . .
since, to complete the European ambiance, we have a European-style on-demand hot water heater. It looks like a rectangular, brushed metal box, mounted on the wall in the main stateroom. It uses propane to heat hot water when you need it. Turn the tap (any tap--kitchen sink, bathroom sinks, shower), the gas clicks on, and hot water gushes out immediately. Anyway, this heater is GREAT. I want this device at home. Currently, on winter mornings you have to waste gallons of water purging the pipes of their icewater burden to bring hot water up from the basement to the second floor. 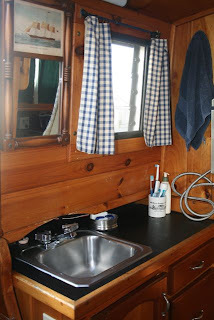 Finally, each of our small staterooms has its own wash-up sink. . . NOT behind closed doors, but right there in the stateroom. Each sink is set into a wooden vanity, which has handy storage drawers. People always ask, "What do you miss most while you are on this trip?" I do miss taking the occasional bath. Also, ladies, our boat (gasp) has no full-length mirror. If we had rough weather, sez the Cap'n, and a big mirror broke, that would be a lot of dangerous glass shards sloshing around. In extreme situations, just head for port and recite to your spouse those five lovely words: "Let's get a hotel room." I have always loved the bicycle in a shower concept!